Sport First Aid 5 Edition As a coach, you'll likely be first on the scene when one of your athletes falls ill or suffers an injury. Are you prepared to take action in a medical emergency? "Sport First Aid "provides high school and club sport coaches with detailed action steps for the care and prevention of more than 110 sport-related injuries and illnesses.Organized for quick reference, "Sport First Aid" covers procedures for conducting emergency action steps; performing the physical assessment; administering first aid for bleeding, tissue damage, and unstable injuries; moving an injured athlete; and returning athletes to play.The new edition explains the latest CPR techniques from the American Heart Association; guidelines for the prevention, recognition, and treatment of concussion from the Centers for Disease Control and Prevention; and guidelines for the prevention of dehydration and heat illness from the National Athletic Trainers' Association.Beyond simply treating injuries and illnesses, "Sport First Aid" seeks to prevent them from occurring in the first place. 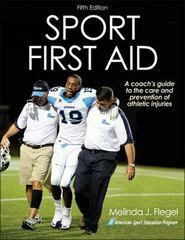 Included are strategies for reducing athletes' risk of injury or illness, such as establishing a school-based medical team, implementing preseason conditioning programs, creating safe playing environments, planning for weather emergencies, ensuring proper fit and use of protective equipment, enforcing sport skills and safety rules, and developing a medical emergency plan. Sample forms, checklists, and plans take the work out of developing these documents from scratch.With "Sport First Aid," you and your coaching staff will be prepared to make critical decisions and respond appropriately when faced with athletes' injuries and illnesses.Produced by the American Sport Education Program (ASEP), "Sport First Aid" is the text for the ASEP Sport First Aid course, which, along with Coaching Principles and Coaching Technical and Tactical Skills courses, makes up the curriculum for the ASEP Bronze Level coaching certification program. For more information on ASEP courses and resources, call 800-747-5698 or visit www.ASEP.com.